Last Friday (12/12/14), the BUDI Orchestra celebrated this festive season with a Christmas Carol Concert in the Atrium, Talbot Campus. They performed classics such as, ‘Jingle Bells’, ‘White Christmas’ and a very moving rendition of ‘Winter Wonderland’. The event was a great success and thoroughly enjoyed by both performers and spectators alike. BUDI would like to extend a huge THANK YOU to everyone that attended the concert, with extra thanks to all of the staff who gave their support so the morning could run so smoothly. We will be starting a new orchestral group in the New Year. If you know someone living with dementia that might enjoy getting involved with the group, please contact me for further information (lreynolds@bournemouth.ac.uk). 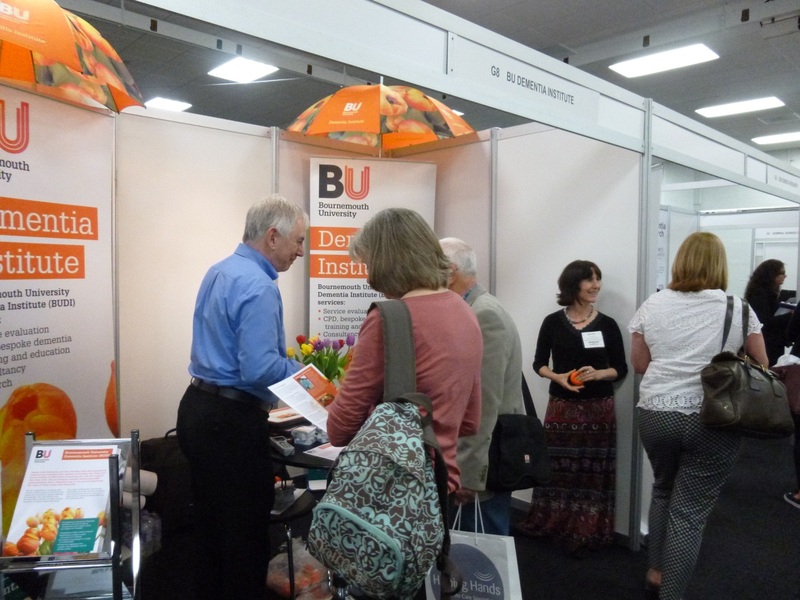 Dr Michelle Heward, Ben Hicks and Sophie Bushell represented the Bournemouth University Dementia Institute (BUDI) at this year’s National Dementia Congress in Brighton between the 10th and 12th November. 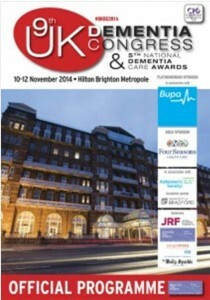 This is the UK’s 9th Dementia Congress, organised and hosted by the Journal of Dementia Care. 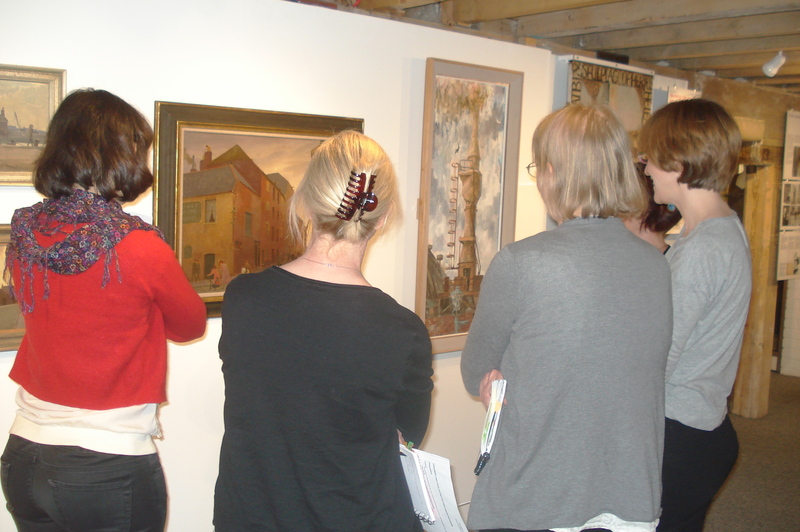 The Congress attracted professionals from a vast array of backgrounds from artists and architects to nurses and social care commissioners with over 200 individuals presenting their work during the event. 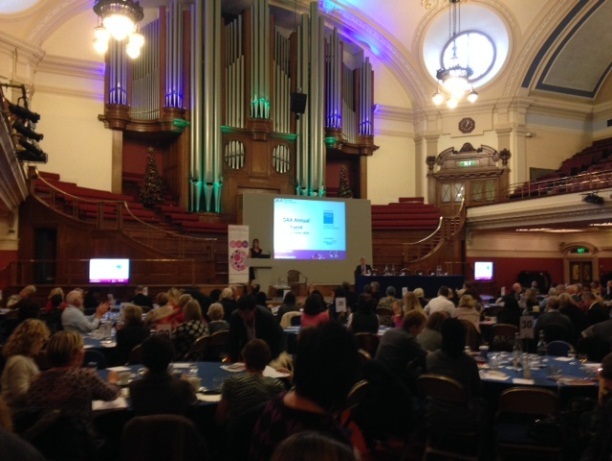 Highlights amongst the spoken presentations included a fantastic and very moving presentation by people living with dementia and their carers from the Dementia Engagement and Empowerment (DEEP) group and Carers Call to Action and the keynote address by Dr Stephen Judd entitled ‘Making Change Happen’. The Dorset Dementia Friendly Communities (DFC) Project Evaluation – reporting on the findings of an evaluation of the first year of activity in the seven localities of the Dorset DFC initiative and exploring how far the Dorset DFC project was able to contribute towards assisting people with dementia to be able to feel supported within their community, and have choice and control of their lives. Click here for the full evaluation report. 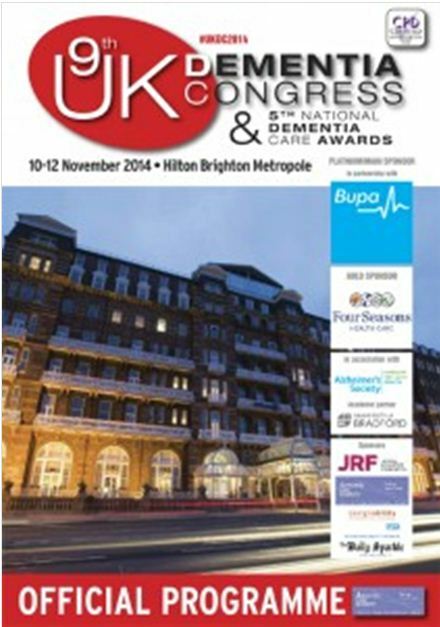 The Social Care and Support Needs of Adults with Concurrent Dementia and Visual Impairment – the aim of the project was to investigate how best to provide care and support for adults living with both conditions in a range of housing settings, and develop evidence-based practice guidance to improve social care and support. Click here for more information about this project. In addition to the speakers there were numerous stands with information about products and services designed to support people to live well with dementia, poster presentations and additional attractions. The most popular of these appeared to be a cookery demonstration by Peter Morgan-Jones demonstrating a technique to improve nutrition and enjoyment of food for people who have difficulties swallowing. 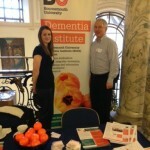 Two of the most delightful things about this Congress were the number and variety of individuals who were clearly passionate about making positive impact upon the lives of people with dementia and those who care for them and the breadth of innovative interventions designed to achieve this. 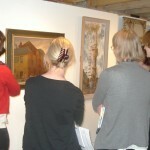 For more information about this event please click here. The use of video within social media (such as YouTube, Facebook, and Twitter) is providing researchers with novel ways of disseminating the findings of research. This is inspiring researchers to think outside of traditional academic approaches, and enabling research to extend to new and wide-ranging audiences. This paper focuses on the Living Well with Dementia project, which was designed to utilise video to raise awareness and challenge gaps in perceptions and understanding of dementia. The project involved filming and disseminating a video featuring people with dementia and carers talking about what it means to live well with dementia. Obtaining the views of people with dementia and carers was considered crucial in terms of portraying the real-life experiences of living with dementia, and enabling these often marginalised voices to be heard. Participants were asked ‘what is your experience of living with dementia?’ and in their responses drew upon diagnosis, treatment, lifestyle, social activities and family relationships. The finished video was disseminated through YouTube. After viewing the video, members of the public were invited to complete a short survey to establish whether watching the video challenged their understanding of dementia. This paper showcases the Living Well with Dementia video, as well as exploring the ethical and practical challenges of capturing the experiences of people with dementia on video. Preliminary results from the survey are also presented, in order to explore the role of video within social media as a method to raise awareness and challenge gaps in perceptions and understanding of dementia. 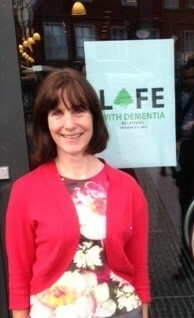 People with dementia get by with a little help from their friends, and anybody can become a Dementia Friend. It’s just about understanding a bit more about dementia and the small things you can do to help people with the condition. People with dementia want to carry on going about their daily lives and feeling included in their local community, but they sometimes need a helping hand to do so. Dementia Friends learn a little bit about what it’s like to live with dementia and turns that understanding into action. This could be helping someone find the right bus or being patient in a till queue if someone with dementia is taking longer to pay. Every action counts. Being a Dementia Friend isn’t about volunteering or fundraising (though you can do that too if you want). Just come along to this session to become a friend and get a simple introduction to Dementia, and how you can help. 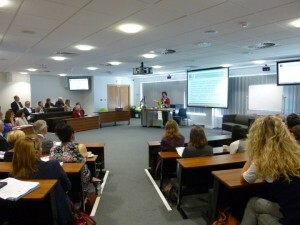 Last week I was invited to represent Bournemouth University Dementia Institute (BUDI) at the 9th Arts and Health South West (AHSW) Annual Conference held in Taunton. This was a great opportunity for me to talk about the Museum of Modern Art’s (MOMA’s) approach to involving people affected by dementia within their gallery space, as showcased in the MOMA Workshops held in May 2014 . I also discussed some of the work that local Dorset museums are undertaking to involve people affected by dementia, and ways to evaluate such activities. 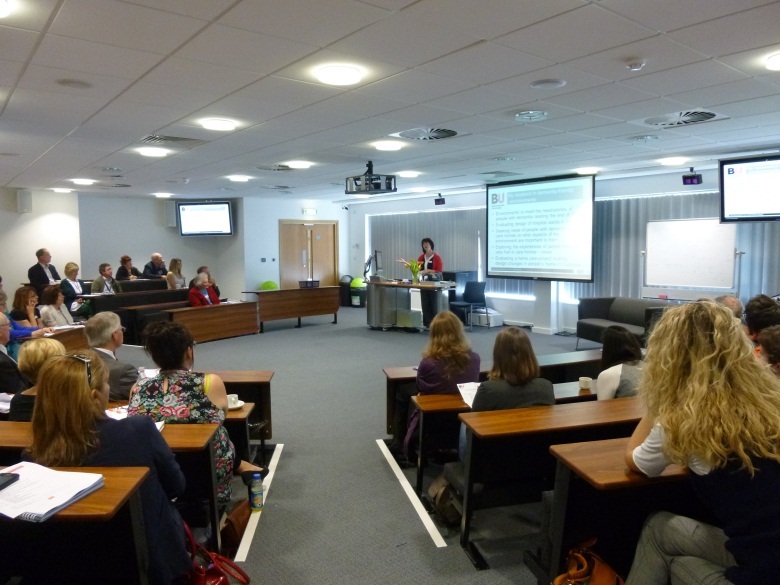 The conference showcased a wide variety of innovative arts based projects, including: the therapeutic purposes of creative writing, doodling, and music and health from Live Music Now. 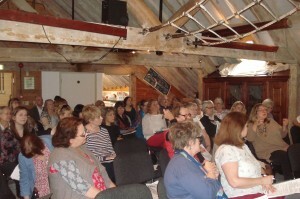 The positive health impacts of arts based activities for a range of participants were highlighted in several presentations throughout the day. 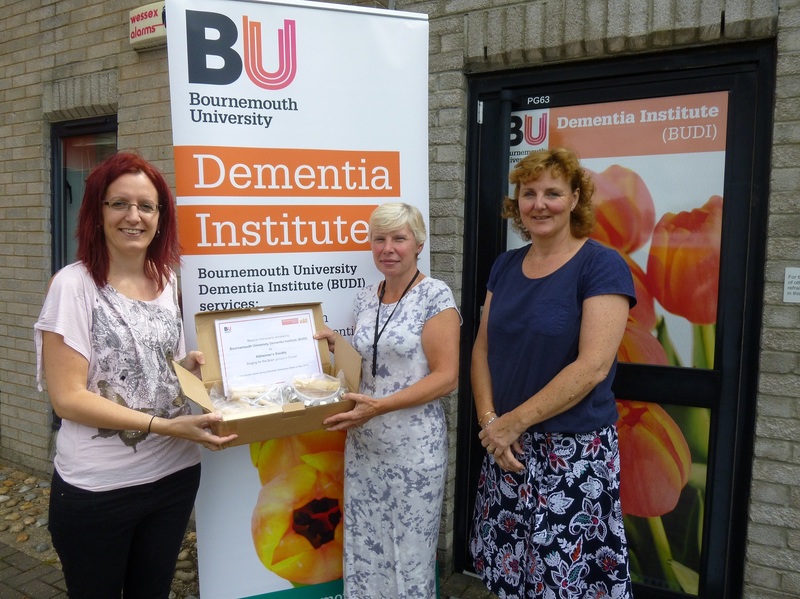 To mark the successes of the Dorset Dementia-Friendly Communities (DDFC) project, a celebratory event was held in Corfe Mullen on 26th September. This event enabled those who had been part of the project, and members of the local communities, to gather to celebrate key achievements since the project began in 2012. Attendees also had the chance to contribute their ideas into planning opportunities and services across Dorset that would help to take this work forwards. 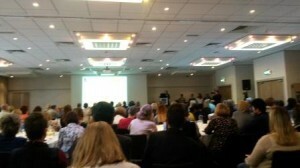 Tuesday 14 October saw the first Wessex Dementia conference hosted by Public Health England, NHS Wessex CSN and The Wessex AHSN. The turnout was much larger than expected demonstrating the increase in interest, enthusiasm and energy surrounding the dementia field. The timeline in the image attached shows just a small selection of projects about dementia that are happening in our region across the dementia timeline; that is from pre-diagnosis, diagnosis, post-diagnostic support to end of life care. 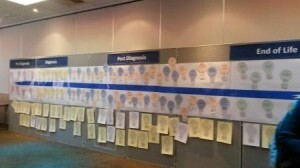 BUDI’s work spans this care spectrum but only a handful of our projects are on this timelines as at BU alone we have been involved in 50 dementia projects in the last 2 years (we presented on our Orchestra project with the BSO, the 10 agency partnership project on Dementia Friendly Communities in Dorset we were part of, and the NHS Dorset Memory Advisory service we evaluated as well as having a very popular stand; orange stress balls proved to be particularly popular for our hard working clinical and practice colleagues!) Taken together with the work of our colleagues from the voluntary, statutory and private sectors alongside our academic colleagues based at other Wessex Universities there is now a critical mass of work going on in our region which bodes well for those who might be affected by dementia in the future in Wessex but also for those currently living with dementia who are participating and hopefully benefiting from the groundswell of commitment to improving not just the diagnostic rate in our region (which two years ago was one of the lowest in the country) but to providing high quality support and services. 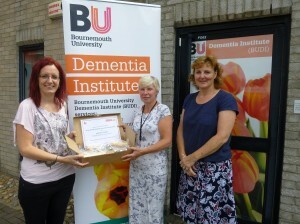 In May 2014, BUDI held a cake sale to raise money for the Alzheimer’s Society Dementia Awareness Week. 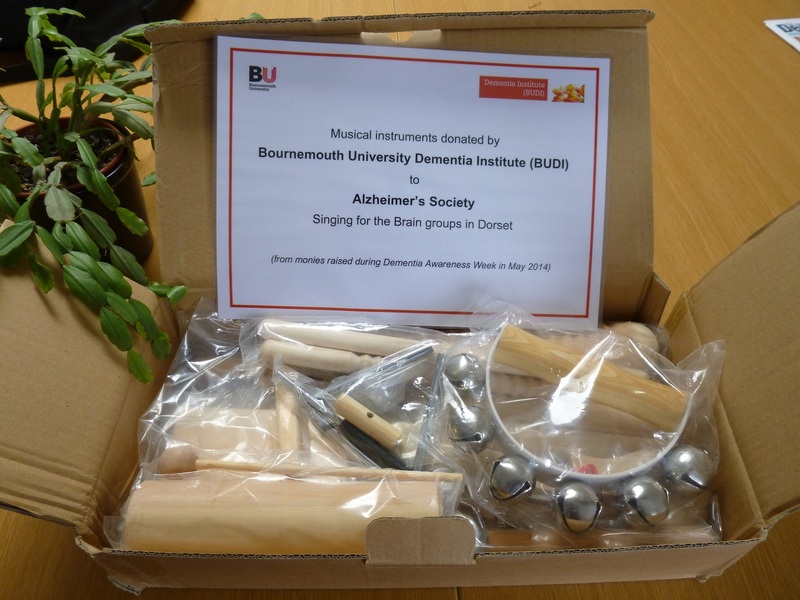 BUDI decided to use the monies to make a difference within the local community, by donating a set of percussion instruments to each of the Alzheimer’s Society ‘Sing for the Brain Groups’ in Dorset. ‘Singing for the Brain’ involves people with dementia and their carers taking part in structured group sessions that use music to encourage communication and participation and include opportunities to talk to other people. 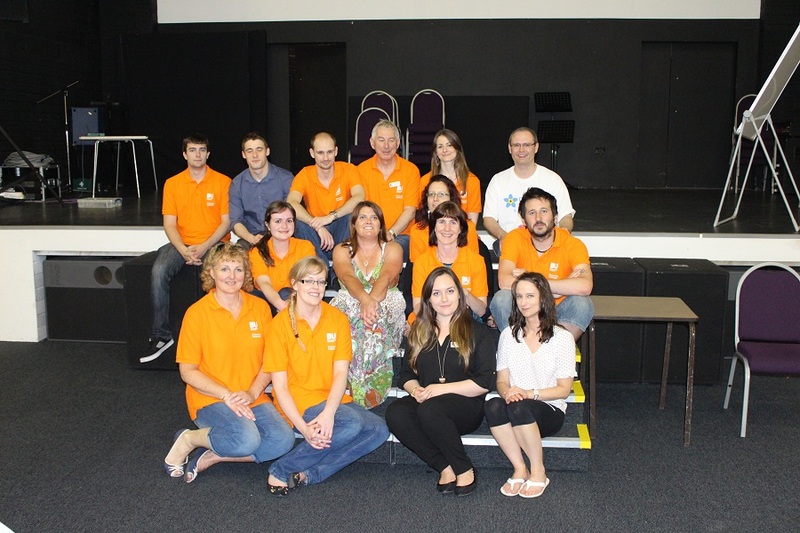 Each session includes a range of activities including vocal warm-up and singing a variety of familiar and new songs. There are eight ‘Singing for the Brain Groups’ in Dorset, which run in Blandford, Christchurch, Dorchester, Gillingham, Portland, Sherborne, Westbourne and Weymouth. To find out more about the ‘Sing for the Brain Groups’ in Dorset, please call the Alzheimer’s Society on: 01202 716393 or email: dorset@alzheimers.org.uk. BUDI would like to thank everyone that donated to this worthy cause, and SUBU and the BU Baking Society for their support with this event. 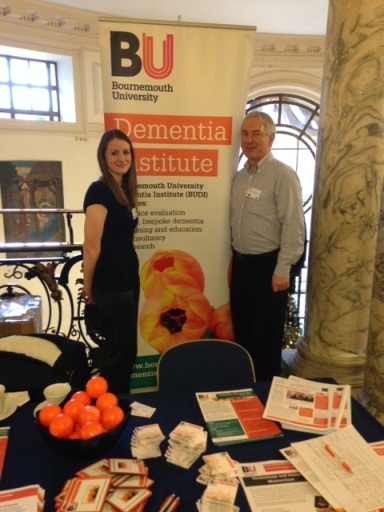 On Saturday the 14 June, 10-2, BUDI will be showcasing a range of projects that all demonstrate how we can live well with dementia. This family friendly event encourages everyone to have fun and play with some of the interactive elements of our research projects. The day will consist of a range of projects which bring dementia awareness to life through music, movement, technology (like the Wii and Xbox), food and stories. 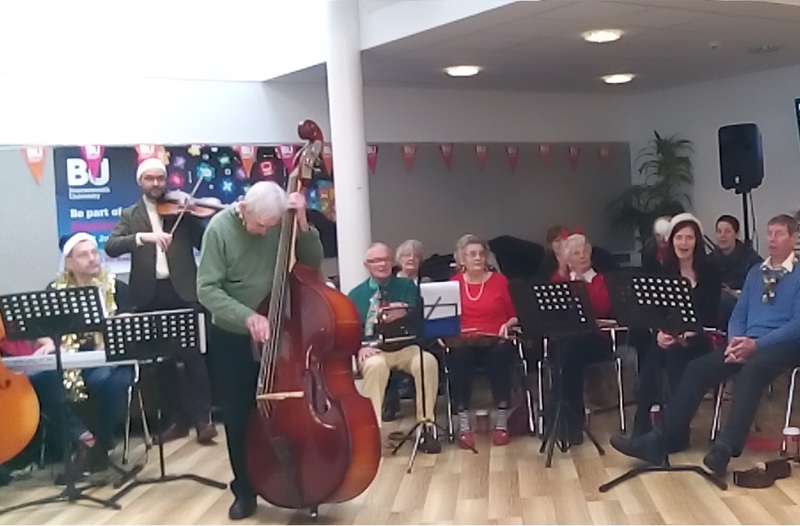 The event will include a special performance at 11am by the BUDI orchestra – comprising Bournemouth Symphony Orchestra (BSO) Musicians, BU Students and Music Scholars, people with dementia and their carers. There are also fun activities for the kids such as cupcake decorating, a bouncy castle and face painting. Parking and refreshments are available. We hope to see as many of you there! The event will take place at the Lifecentre, 711-715 Wimborne Road, Winton, BH9 2AU. If you would like more information about our event please contact: cspeke@bournemouth.ac.uk. My observations of the process this time centre around three things – first, the strong sense of a social group that has been created/formed by all involved, from the friendly welcomes, the catch ups over coffee and the general encouragement the group offered each other during the session. Second, I was also pleasantly surprised that carers sought me out to thank us for putting this group together and to share the positive impact they had observed themselves during the sessions on their relatives with dementia, but also how friends and family at home had also remarked on a positive visible difference in their relatives. 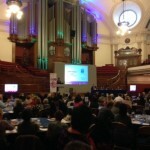 5 sessions and observed differences – is this the power of music? I was also struck by the questions asked of me about ‘would the group continue’ and as with any short ‘intervention’ type study feel the weight of not being able to promise to deliver again on something that is being hugely enjoyed by participants (and which we all hope will evaluate positively in a research sense – but only time will tell…). I guess this lack of being able to promise to continue with a service is kind of like service providers with limited budgets and short term initiatives… Hopefully we will secure funding to enable this work to continue, as even the community musician from the BSO with huge experience of outreach work feels this is a ‘very special’ project with amazing and fast results that everyone involved is observing. From week 1 where participants were nervous about trying out the instruments to now being very comfortable with playing around with (lots of experimentation in terms of how to hold a violin in a comfy position) and actually playing the notes. 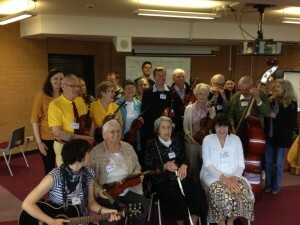 I was also struck by carers telling me of their attempts to ‘practice’ at home – downloading or recording the pieces they have been introduced to during the sessions and singing, humming and dancing along at home – as unfortunately the violins cannot go home with the participants – and how enjoyable they are finding the sessions beyond coming along to the rehearsals themselves. 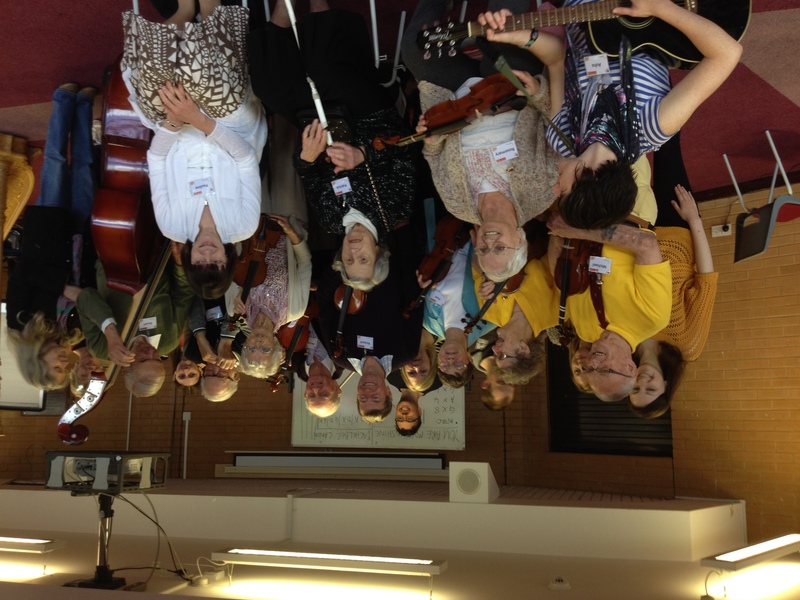 My final observation is also the growth in confidence of the musicians, our students as well as those with dementia and their carers in how they relate to one another, how they try out new pieces and are no longer as hesitant to experiment as they were in the first session. The combination of body percussion, instrument playing and singing that the musicians have created by paying close attention to how everyone responds has led to a session format that is uplifting, fun, creative while also creating intense concentration amongst all participants as they learn and work together. I wish I could find time in my diary to attend all the sessions as they leave me feeling upbeat and positive; something that was clearly evident not only from what I observed but from what I was told by everyone in the session yesterday.